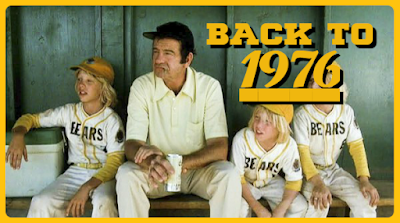 Our look at the films of 1976 ends with a movie that I believe changed everything. Dear reader, this is the final installment of “Back to 1976.” Over the past fifty weeks, this feature has attempted to look at a brief window of time, specifically the year between Jaws and Star Wars, when the film industry was a step beyond the introspective and occasionally-angry movies of the early seventies, but hadn’t quite reached the roller coaster rides of the blockbusters that would soon dominate the box office. I believe, and have hopefully offered plenty of evidence in support, that 1976 was a transformative year full of diverse, wonderful, imaginative movies that capture a society in a state of flux. I’ve saved Rocky for the very end because I believe it sums up 1976 nicely. Rocky is a triumph, perhaps the crowning achievement of its writer and star, Sylvester Stallone, who puts all of his fears and insecurities into his script, but also all of his ambition and hunger. I will spare you a recap of Rocky (I suspect we’ve all either seen it or might as well have seen it), and will instead be focusing on the themes and why I cherish the film so much. Some classify (and diminish) Rocky by labeling it as a movie about boxing, but that’s like saying 12 Angry Men is a film about law. Boxing is the backdrop that allows us to dig deep into rich characters and find out who they are, what challenges them, and how they deal with their own individual adversities. The first half of Rocky seems to mirror the first half of the seventies. We are introduced to tired characters living out a lonely existence and doing whatever they have to do to survive. Everyone in the movie seems to have made some sort of compromise: by night, Rocky Balboa boxes below his level because it doesn’t challenge him or force him outside his comfort zone, and by day he’s an enforcer for a local loan shark. 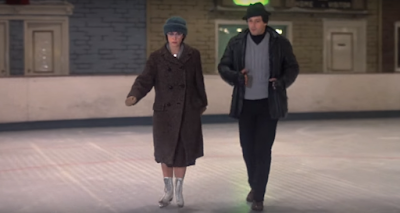 Adrian (Talia Shire) hides behind glasses and pretends to be invisible. She’s given up any chance at a personal life and is serving as a caretaker to her brother Pauly (Burt Young). Even Pauly has compromised, settling for the bare minimum and struggling to make ends meet while retreating into alcohol as an escape from his disappointment. Anger and resentment bubbles just under the surface of every character. 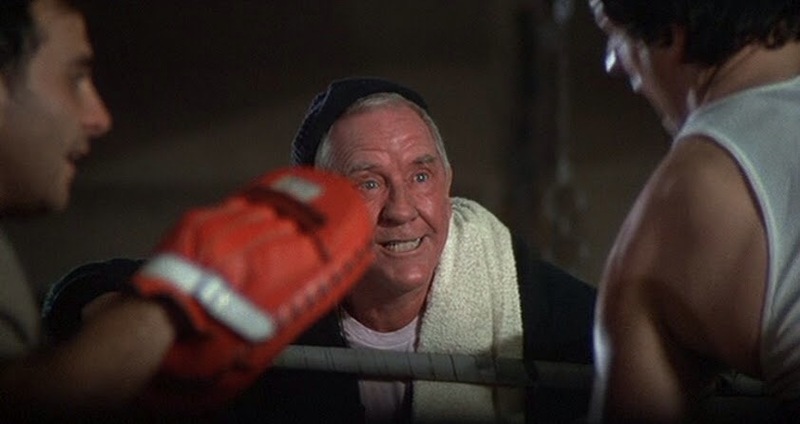 Rocky shows his when his prospective mentor Mickey (Burgess Meredith) comes to him chasing his own opportunity. Adrian shows hers when her brother finally uses her as a doormat one too many times. Pauly shows his through the whole movie, quick to blame his problems on everyone else. Each character reacts differently—yet believably—to their own dead ends and rejections. I believe this reflects the mood and atmosphere of the first half of the 1970s, especially as evidenced in film, with many movies from those years displaying characters that have lost their moral compass and feel beaten by life. These were the years of Watergate and the final days of the Vietnam War, when trust in each other was low and trust in leaders was nonexistent. The first hour of Rocky is slow, searching, and almost mournful. Then something happens. When Rocky gets an opportunity to face off against the champ Apollo Creed (Carl Weathers), the movie begins to ascend. That ascension is mirrored in the score by Bill Conti. 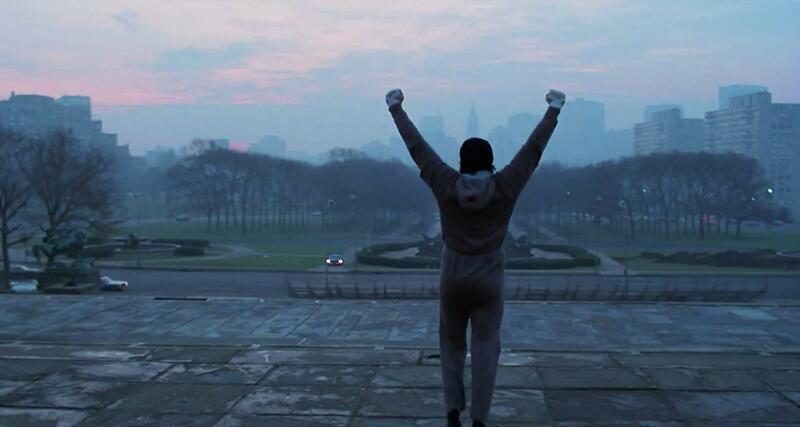 It’s mirrored in the lives of those around Rocky Balboa as the character decides that he’s not content to continue in the life that he’s been living. He’s been given a chance at something better and he’s going to do everything in his power to seize the opportunity. When this happens, Rocky changes from a movie about people wasting away with their own unfulfilled dreams to facing their oppression head on. Rocky begins to train harder than ever. Adrian stands up for her own desires and makes a break from her own prison. Even Pauly, a pessimist and defeatist, seems to have a new perspective and purpose. 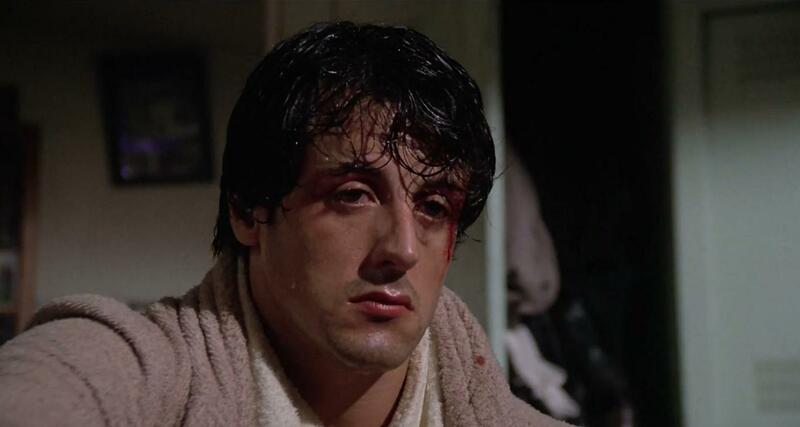 Through it all, the goal for Rocky is never to WIN. He knows that the deck is stacked against him and that he is not the hero in this fairy tale. The goal is to survive, to look life square in the face and refuse to be beaten and broken. As the character states himself, all he wants to do is go the distance. The journey is the destination, and by refusing to be beaten, Rocky faces his own adversity and becomes a symbol to those around him. The movie ends in an entirely different place than it started, and the characters who were so passive in the first hour have all become fighters in their lives. As cheesy as it might sound all these years later, the chorus during the climactic musical montage tells us what they’ve accomplished: “Trying hard now, getting strong now, gonna fly now.” Those words aren’t just about Rocky. They’re about Adrian. Mickey. Even Pauly. I believe they’re also about the viewer. The true narrative of 1976 isn’t as neat as a Hollywood screenplay and it would be too simple to say Rocky was the movie that instigated a sea change, but it did most definitely touch something in the culture of that year. In my mind, this film told a battered and weary public that it was time to get up, to fight, and to get busy making the world better again. The movie was nominated for a multitude of Academy Awards the following year and won for Best Picture and best director (John G. Avildsen). There’s been much debate as to whether or not Rocky deserved the top honor, especially since it was against powerhouses like Taxi Driver, Network, and All the President’s Men. But looking at that list of other Best Picture contenders, Rocky is the one film that was inspirational, an uncommon sentiment for the time. Whether it deserved it or not, something had changed in Hollywood and in the minds of the viewing public. I don’t think that change happened overnight, but I do believe that the movies of 1977 and beyond are different from the movies of 1976. There’s a more optimistic tone, and with the arrival of both Star Wars and Close Encounters of the Third Kind, the modern blockbuster became a regular staple at the cinema. Bigger budgets, bigger returns, bigger stories, BIG would very soon come to define a significant portion of what was playing. Even by the time of Rocky II, just three years later, the themes that made the first movie so special had evolved into something bigger and less admirable. But the original movie, with a budget of less than a million dollars, seems to have been the right movie at the right time. Rocky opened nationwide in December of 1976, and therefore seems like a fitting coda to both this series and to that year in film. I hope you’ve enjoyed our look at these movies over the past fifty weeks, and I also hope that you’ve seen how wacky, crazy, unpredictable, moody, optimistic, pessimistic, exploitative, melodramatic, and ambitious many of these movies have been. I started the series with a thesis that the films of 1976 existed in a wonderful bubble in time that would soon burst and give way to something new that was equally imaginative, but perhaps not always quite as human in approach or execution. As I conclude, I can tell you that these movies have been everything I thought they were and more. Thanks for coming along for the ride. Get more Heath Holland at his blog Cereal at Midnight! This is a great reading, Heath, and I love that it pays off the entire '76 series. Thanks! Thanks, Rob. I really appreciate it. I never thought about it this way before, but given your point about the first half of the movie mirroring early seventies films... and the second part being crazy aspirational, there was almost no way this WASN'T going to win the Oscar. (For the record, I was fourteen in 1976 and I was pulling for Network.) Great column. I'm gonna miss it too, Eric! I'll be back with a spotlight on another year as soon as Scary Movie Month ends. I'll go ahead and announce it now: "Back to 1895" and I'll be talking about the fifty-second short "Arrival of a Train" one minute a week for fifty weeks. Darn it. I meant a second a week. I enjoyed the column a lot, Heath. Like others stated, I was introduced to many films. The 1970s is my favorite period of American cinema. The pessimism you allude to is a primary reason for that. There is also an honesty in the films that I appreciate; they do not portray life in a sugarcoated way. As much as I admire the creativity of the 1980s and following decades, I miss the edginess that was the hallmark of 1970s films. I discovered your Cereal at Midnight channel through the column. Being an occasional- for economic and space reasons- thrift store movie shopper, I can appreciate the excitement of a great find. That's super cool of you and very kind. Sometimes I think we're living through the first part of the seventies all over again, but then the anger we carry these days seems less direct than in seventies films. Plus, today it's often draped in special effects and lots of flash, which is very different.